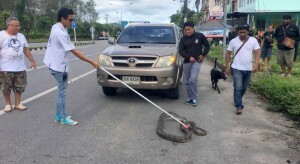 A man driving along Srisoonthorn Rd in central Phuket yesterday was given a surprise when another motorist signalled for him to pull over and yelled that there was a big snake hitching a ride under the pickup truck. Arkom Bobthong, 49, was driving his three-wheeler motorbike with sidecar (samlor) home at about 2:15pm yesterday (Oct 30) when he saw the snake hitching a ride under the moving pickup truck. 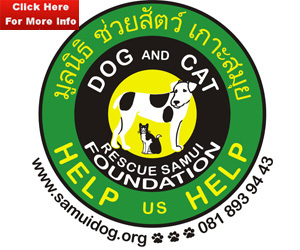 After Mr Arkom on his samlor and the pickup truck driver pulled over, they called Kusoldharm Foundation rescue workers to come and free the snake, which was reluctant to alight from the vehicle. After a lengthy effort to capture the snake with their trusty “pole with noose” device, the rescue workers were finally able to bag the python. 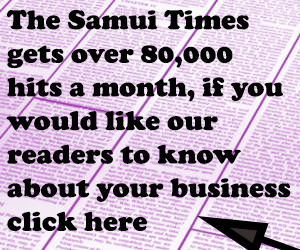 “It was over two metres long and weighed 11.5kg,” one rescue worker told The Phuket News. As is standard practice, the rescue workers later released the snake at an undisclosed location.